On 27th October, RUSH York hosted an exclusive event for professional stylists. The event took place at 19 Market Street, YO1 8SL, York. RUSH International Creative Director, Andy Heasman led the event. He demonstrated cutting edge techniques and styles throughout the day. The Stylists also had a day of Education and a full day of training. 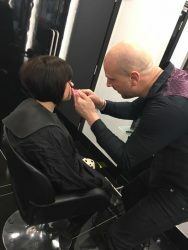 The York team were extremely excited to have Andy in the salon as he is a multiple award winner and recently won the Fellowship Hairdresser of the Year award. Andy arrived at the salon early and was ready to teach at 9am. He went through some cutting techniques and then went on to do a demonstration. He created a fabulous cut and showed the stylists how to deal with the model’s hair type and density. After Andy had finished his demonstration, more models arrived at the salon. The models sat down for a consultation and explained to each of the stylists what they wanted. Andy then explained to each of the stylists what would be the best way to achieve the look. The day was successful. The stylists left the salon excited to use their new skills on their next clients. RUSH East Grinstead is now open!